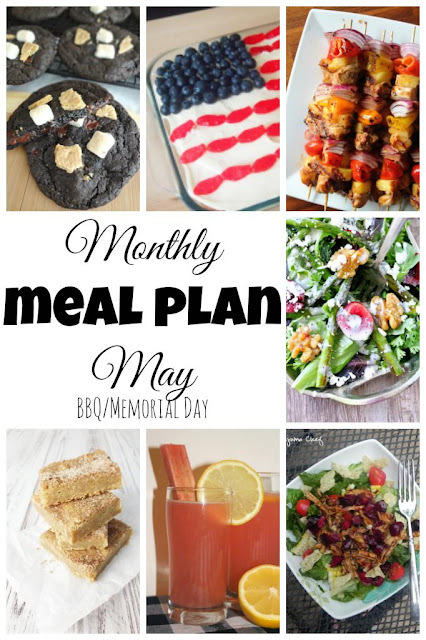 It's time for May's Meal Plan - May means the kick-off of picnic and grilling season. 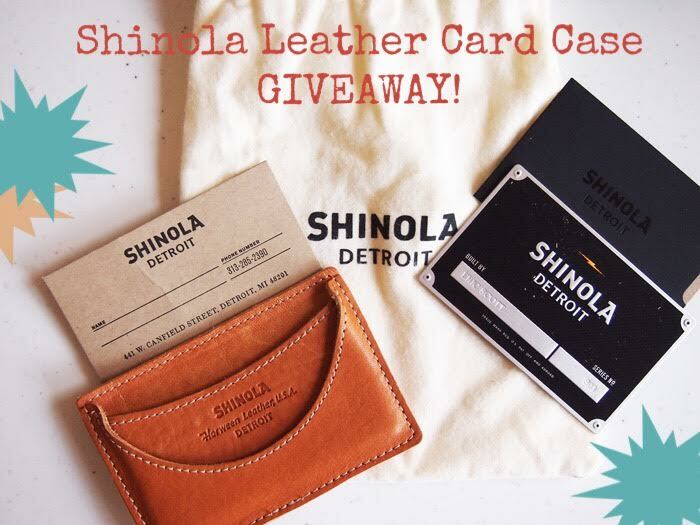 This month we also have a giveaway just in time for Father's Day! Check out all the great recipe ideas and then make sure to enter at the bottom of this post. Is it bad that we bought a 50 pound bag of potatoes at the end of October and they were gone before the end of April? I mean, I did make mashed potatoes for Thanksgiving from that bag, so we didn't really eat them all by ourselves, right? OK, so we have a *slight* potato obsession in our house. We eat oven fries a lot. They are such a quick and easy side dish and go with so many meals. 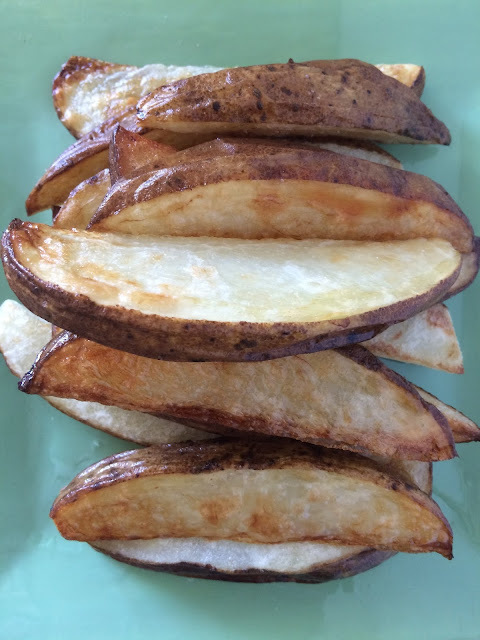 Recently, I wanted to change our regular oven fries up a bit and decided to try flavoring them with vinegar. I love salt and vinegar potato chips, so it seemed like a good plan. I was correct - these were delicious. Just enough vinegar flavor and tang without being overwhelming. Then roasted and topped with salt to finish. Dip these in ketchup, or enjoy as is (or even splash on some extra vinegar if you so choose). This recipe will serve about two people, but it is simple to double if needed. Our twins are starting to show interest in our food. They want to grab everything we are eating and love to sit at the table with us now. They've started eating a few finger foods (or trying to- they often miss their mouth or drop it before it gets there!) like small noodles and soft fruits. So, I wanted to make them some pancakes to try for dinner recently, but I wanted to keep them simple in ingredients and also relatively healthy. 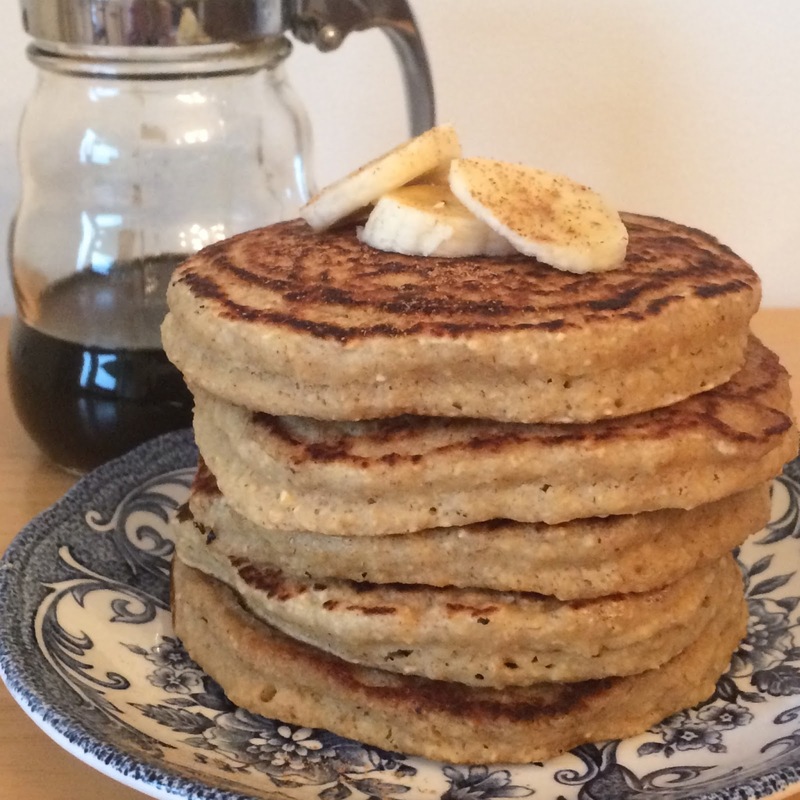 They like oatmeal and they love bananas, so I used the banana to sweeten up these pancakes and oats for the base. We broke them up into small pieces and put them on their trays to feed themselves along with some small pieces of extra banana. As a real treat, we did dip a piece into real maple syrup for each of them. They were mixed on that, but they both really enjoyed the pancakes! My husband and I ate them for dinner, too - so they aren't just for babies and toddlers. 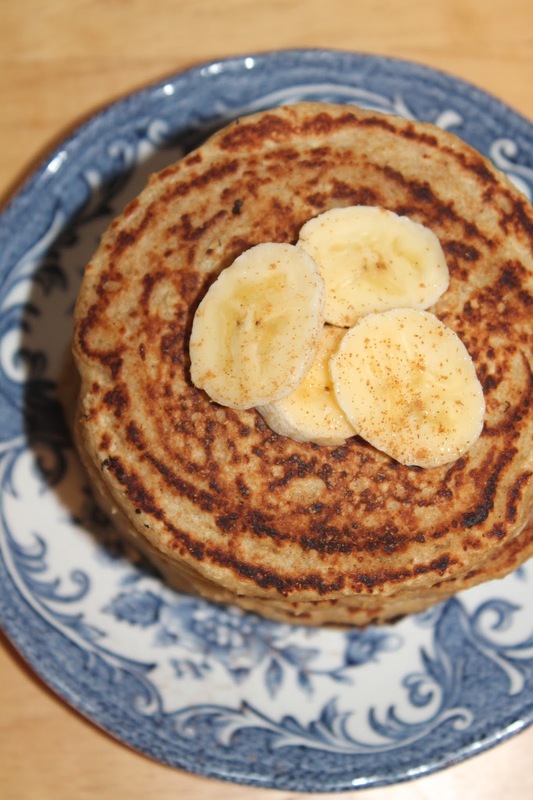 This recipe will make about 10 pancakes. In case you missed earlier posts, I've been doing a small series on baby and toddler foods since they've been the focus of a lot of my cooking lately. I love making new foods and flavors for them to try and watching their reactions. I also have a Facebook group Baby & Toddler Food Recipe Share for those who may be interested. This meal is a classic from my childhood. My mom made this quite frequently during the cold weather months and we always enjoyed it. 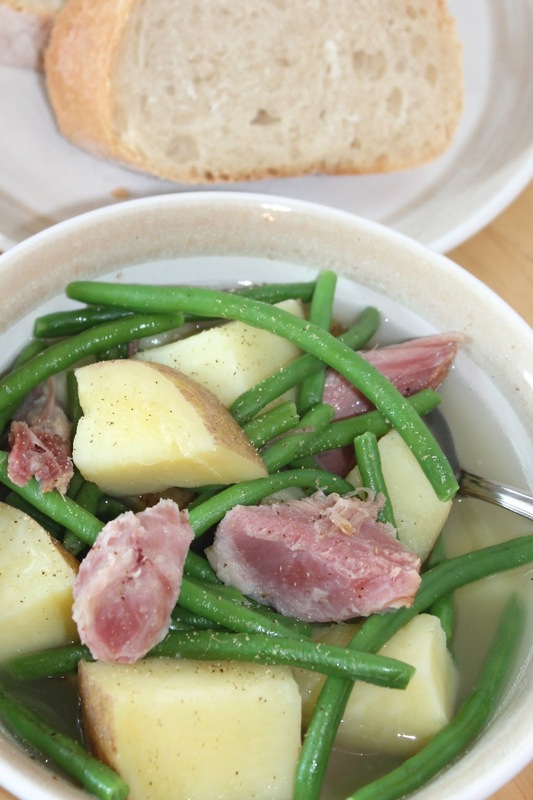 This and ham, bean, & rivel soup were two Pennsylvania Dutch family dishes we looked forward to having for dinner. They are simple, homey dishes. This recipe is so simple, it's truly barely a recipe haha. Just a few simple ingredients turn into a tasty meal. Dinner doesn't always have to be complicated or fancy. It's also a very frugal meal to feed your family and, for us, adding twins to our family has encouraged us more than ever to buff up on our frugality skills. We get a half of a pig each year, so our freezer is always well-stocked with ham hocks and hams. 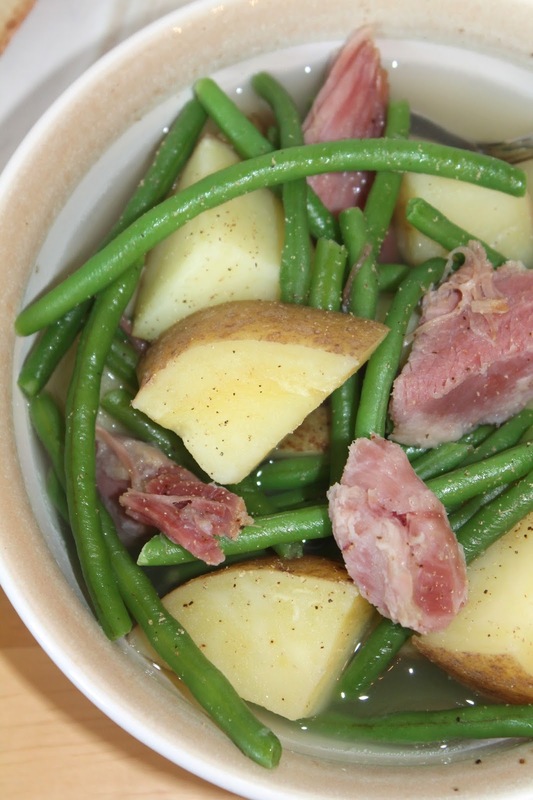 I thought that with the Easter holiday coming up, this would be a good time to post this recipe because if you have some leftover ham and a meaty ham bone, you are all set to make this meal next week with your leftovers. I used a ham hock, but either is fine as long as there's enough meat on it to feed about four people. I've posted a few other Pennsylvania Dutch recipes in the past. I have two cookbooks that I like to try recipes from and you can get cheap or free e-book ones on Amazon (currently) if you want to look through them. Each one is a little different, and we always find dishes we want to try. This recipe will serve about four people. Serve it with a side of crusty bread or drop biscuits with butter. I've also seen people serving it with cider vinegar on the side. We never did this when I was a kid, but I think next time I'll give it a try. My husband and I were perusing through The German Cookbook the other week looking for new recipes to try. As I'm sure I've mentioned several times before, we really love this cookbook and we like trying new recipes from it. Also, we've both been teaching ourselves German using Duolingo for a few years now and we speak our very elementary vocabulary around the twins. Maybe the will pick up bits and pieces of a second language as they learn to talk. So, when we were looking through the book, my husband immediately stuck a bookmark into the page for this quick coffee cake (called Blitzkuchen or "lightning cake"). I added a little more cinnamon and a bit more salt in this version. 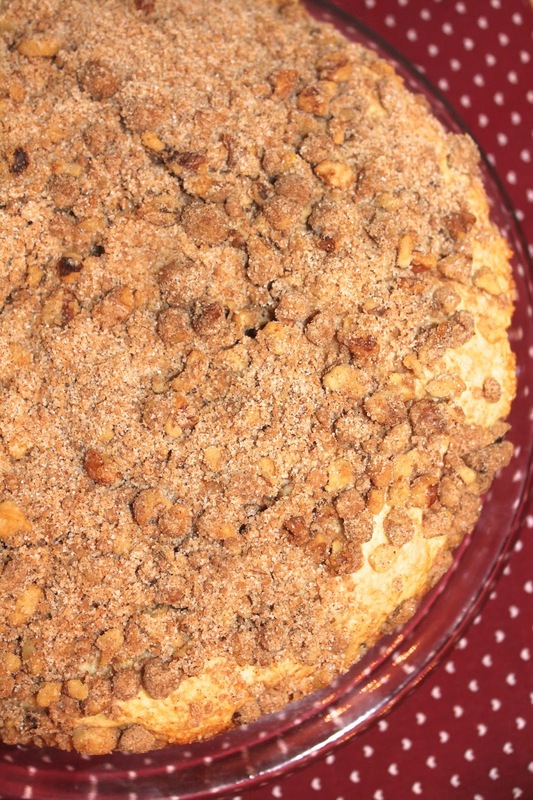 What I really loved about this coffee cake was that it is simple to make and also simple in flavor. It's not very sweet at all, making it really lovely for breakfast or brunch, or alongside a cup of afternoon coffee. The crumb texture of the cake itself is really nice as well. Add this quick coffee cake to your Easter brunch or Mother's Day breakfast, or as a weekend treat for your family. This cake will serve 6-8 people, depending on how large you cut your pieces (probably 6 haha). Blueberry, beet, & apple purée (1 cup of blueberries, 2 medium beets, 1 large sweet apple - Peel, chop and steam beets until softened, add a bit more water to the pan and add blueberries and apple. Cook until tender and then puree, using the steaming water as needed). I wrote a previous post about making homemade baby food purées for our twins. They are now 8 months old and have tried a lot of fruits, vegetables, yogurt, cereals, and some meats. We started with single-ingredient purées to ensure that neither of them had a reaction to the food. Now that they've tried many things, and we know what they like (and don't like so much), I'm making more advanced purées combining multiple foods. I try to pick a variety of colors of foods as well as starting new textures (e.g., kiwi seeds, beans). My homemade purées are thicker and not as smooth as the ones in a stage 2 jar/container from the store. Also, I don't use one method for cooking. If I am roasting a squash for our dinner, I will roast one for them as well and use it for baby food. If I'm baking, I may toss some sweet potatoes or beets in the oven to cook for baby food. I boil and steam as well, cooking harder foods first and then adding softer ones. 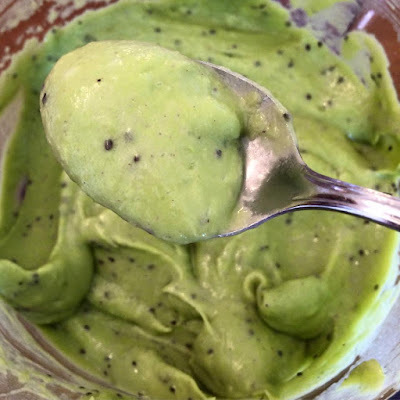 Avocado, kiwi, & banana purée (no need to cook - just blend 1 halved and peeled avocado, 3 peeled and quartered kiwi, & 1 ripe peeled banana until smooth. Add 1 teaspoon of lemon juice to reduce browning, if desired).